Charity never stops, even in the hottest summer ever. Today I was really pleased to meet Daniele Strano and listen to his adventure: 40 years old sardinian athlete who is crossing Sardinia by kayak for a month to raise money for Save the Children. He left on 15th July from Lido of Cagliari by kayak, carrying twenty pounds of food and water and another 15 pounds are of “logistics”: tent (Daniele will sleep on the beach), sleeping bag, some clothing. He is paddling throughout the Sardinian coast, including small islands, reaching all the beaches where operators in a spirit of solidarity committed themselves to make a donation to Save the Children. Today he reached Maladroxia on Sant’Antioco Island, where Giancarlo and the staff of Penelope Beach welcomed him and made a donation. 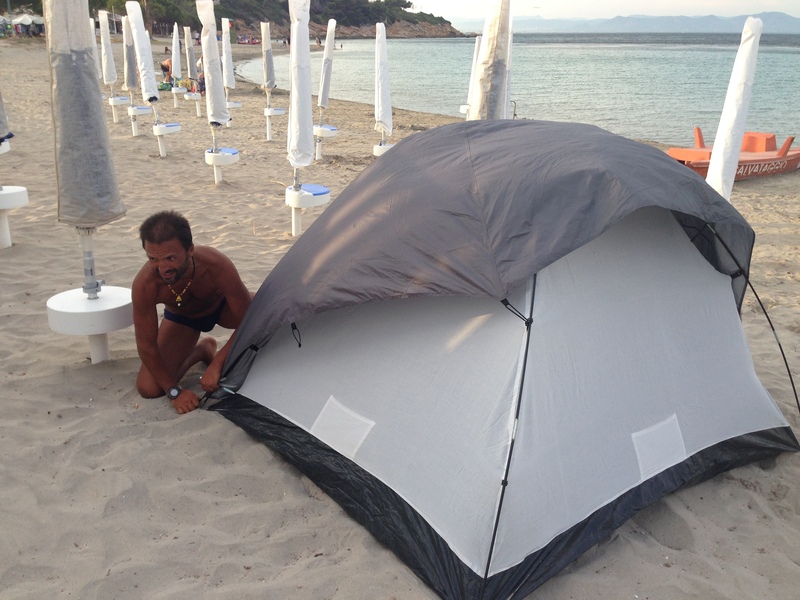 Daniele will sleep in tent tonight and tomorrow, due to mistral wind, he will probably spend the day at the beach. If you come at Maladroxia, you might meet him and decide to back the two causes he is supporting: the fight against infant mortality in the world and the poverty of education for children in Italy. Otherwise you can follow his adventure on his facebook fan page Strange Kayaking Sardinia, download the Shark Paddle application and make a donation for Save the Children. Good luck Daniele, I wish you all the best and a great success on your adventure! thank you for your appreciation. At the moment I don’t allow guest posting but i’ll let you know if I change my mind.